The first step in joining GB Deaf Swimming is to join your local competitive swimming club as we don’t offer weekly swimming lessons. We welcome all competitive swimmers with a hearing loss of all standards from across the United Kingdom. There are currently 2 competitive categories starting with a loss of 25Db or more. Please contact us for more information. We annually hold the GB Deaf Swimming Championships and it is open to ALL British hearing impaired swimmers as long they are registered with Swim England / WASA or SASA. Our coaches identify teams to represent Great Britain at the Deaflympics and we select our own teams to represent GB at international events including the European & World Championships. In order to take part in the training events organised by Great Britain Deaf Swimming Club (GBDSC) or to set GBDSC records you are required to be a fully paid member of the club. 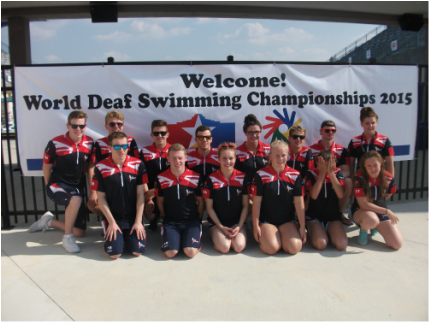 GBDSC is run by volunteers who are keen to help to create opportunities for deaf swimmers. If you think you can offer help or support please feel free to contact us.